We are seeking qualified graduating seniors who are interested in our annual Scholarship. Please share the scholarship form below with anyone you know who might be interested in applying. 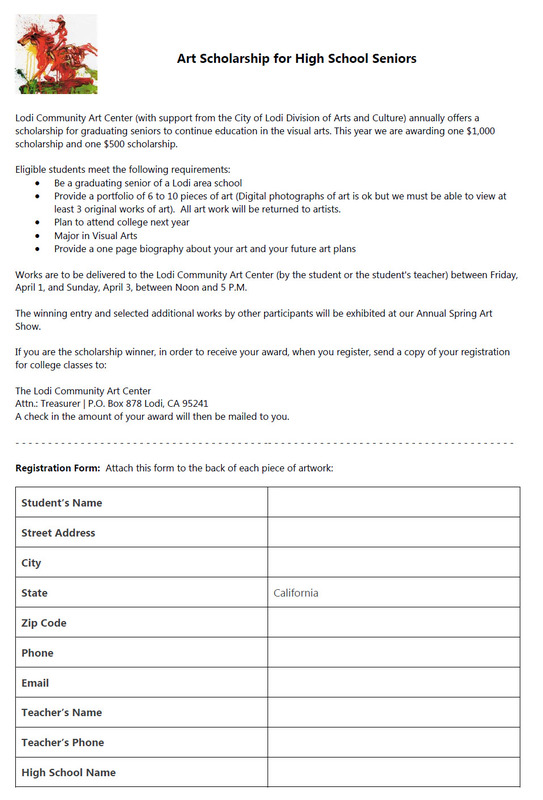 The Lodi Community Art Center (with support from the City of Lodi Division of Arts and Culture) annually offers a scholarship for graduating seniors to continue education in the visual arts. This year we are awarding one $1,000 scholarship and one $500 scholarship. Provide a portfolio of 6 to 10 pieces of art (Digital photographs of art is ok but we must be able to view at least 3 original works of art). All art work will be returned to artists. Works are to be delivered to the Lodi Community Art Center (by the student or the student's teacher) between Friday, April 1, and Sunday, April 3, between Noon and 5 P.M. The winning entry and selected additional works by other participants will be exhibited at our Annual Spring Art Show. A check in the amount of your award will then be mailed to you. Download the application to print and bring to the Gallery. You must attach a form to each piece of submitted artwork.